Enjoy a soothing bathing experience: a raw copper bath equipped with candle, pots of mineral salts, aromatic fresh herbs, essential oils and flower petals - all adapted to your preferences. Think of it a spa for one. Echoing the white, tonal greys and copper evident throughout The Barn, our specially-designed bathing room expresses nature’s honest beauty, with original grey flagstone flooring and chunky oaks beams balanced with eclectic furnishings and hand-sourced lanterns. Utilising copper’s natural vital, clean and healing properties, plus a personalised music system and mood lighting (tailored to match your mood) our bathing room is a place where you can step out of the stress and tensions of everyday life and pause for private moments of reflection - particularly before or after a treatment. A healing space for true relaxation and escape. when added to a holistic therapy. Enjoy a soothing seaweed bath with Haeckels Seaweed. This 100% natural traditional seaweed bath is packed with natural antioxidants and essential vitamins. 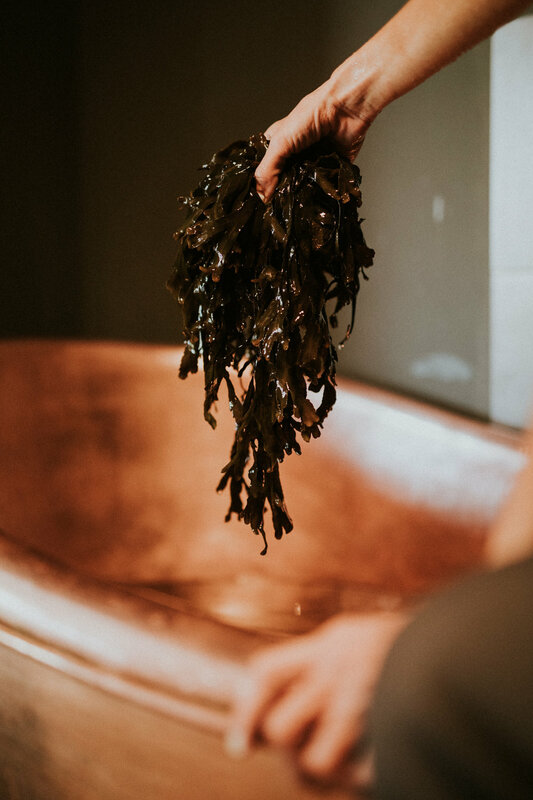 Seaweed baths have been used for generations in the repair of the skin, and have shown to help with signs of ageing, cellulite development, arthritis and eczema. Seaweed therapy is also recommended for those affected by insomnia or sleep apnea. Seaweed is also said to possess an electrolytic magnetic action and so releases excess body fluids from congested cells, dissipating fatty wastes through the skin pores. In addition, it also replaces depleted minerals such as potassium and iodine, boosting thyroid activity and helping to maintain adrenal regulation and hormone balance. See our packages page for a relaxing experience with our beautiful copper bath.